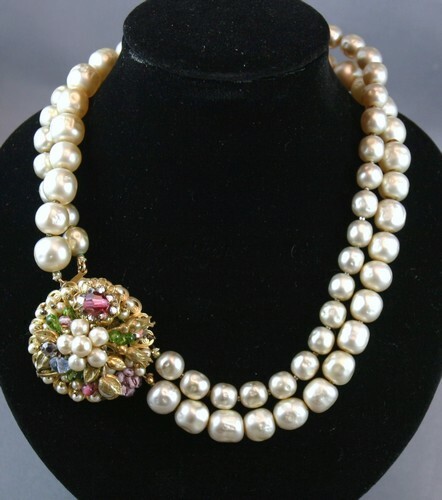 Beautiful Robert deMario vintage simulated pearl necklace and earring set. Floral design goldtone clasp with pearls, beads and rhinestones plus matching earrings. Necklace stamped: Robert deMario N.Y.C. Earrings stamped: Germany. Mid-20th century. Clasp: 1 1/2 inches diameter by 3/4 inches high. Necklace: 15 inches Earrings: 1 inch diameter screw-ons.